I was recruited by Falconstor to launch a software as a service (SaaS) division. They create storage virtualization software and primarily sell to the Fortune 1,000. What that means is they basically make very expensive backup software. The point of the SaaS division was to sell the software on a monthly basis instead of on a one-time basis. At first we wanted to target small to medium businesses, but I wanted to go bigger myself. I thought, what if we formed partnerships with companies that could sell this as a service. So Falconstor provides the software and the company can sell it as a service and a revenue split is setup. Seems logical to me, so I started contacting companies. Who do you contact in this situation? Basically any company that can sell this to consumers, businesses or as a professional service. Now contacting companies and getting in the door is no easy task, but that is one thing I am very good at. I am able to get into any company I want in literally just a couple days. Now creating an actual partnership is another story, but I am very resourceful. I visited the IBM corporate offices in the US and Canada and I have to say they are very different. US was like a ghost town because at the time many people worked remotely. It also had the jail feel, where everyone had their own small office and were disconnected from every0one else. The Canada office did have its own divisions, but each division was more of an open floor plan. It was actually fun to be there. Almost seemed like everyone genuinely loved their job. But hey, maybe that’s just how Canadians are. I visited AT&T in New Jersey and they wanted to provide the same services as IBM. Professional services out of their data centers to their larger customers. They also wanted to setup local storage in their customers locations to have local and remote backup. Having local backup would make it easier to restore data. Both companies also wanted to provide backup inside their data centers to their data center customers. Same concept, have local and remote backups. One thing about corporate backups was all the changes put into place after 9-11. There was HIPAA and other new laws that forced many companies to have remote backups a certain distance from their offices. Both companies wanted to take the software and provide professional services out of their data centers. The software would provide any size company with the ability to do remote backups to a data center and they would store the data on disks, tapes or even provide another remote backup for aged data. Both deals were unique at the time and took about 18 months from beginning to end. In these partnerships, Falconstor provided the software and both companies created a Network Access Storage (NAS) box that would be sold in stores to Small and Medium Businesses (SMB), home offices or anyone that had the need. The SMB market and the home office were the primary targets for this product. 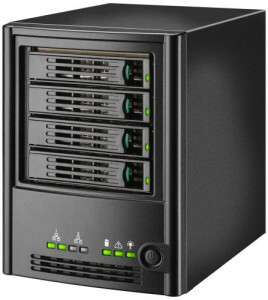 The NAS could handle 2TB of storage and could run RAID-5 in case a hard drive failed. All you would have to do is pop out the bad hard drive, put the new one in. The NAS boxes were sold in stores like Best Buy. I brought one home and used it since I am a data hog. I have terabytes of data and a backup freak. It was a great box, was very small, held 4 hard drives and was easy to configure from any browser. Other deals that I put together were with SoftBank, SAVVIS Communications and some others. All of the deals were similar in the structure of the partnerships. I was at Falconstor for about 18 months and left because of typical corporate America problems. Most of the time they try to screw you. If you want the full story, feel free to contact me. Since I put all of these deals together, I have since expanded my contact list and have formed many other partnerships over the years. Each one of these deals was said to be worth $10 million each, but I didn’t stay around to see all of them through. Today, its obviously much easier to backup your data with Western Digital or similar drives and also much cheaper. Still amazes me how fast technology moves.